Let me tell you about my boat. The Life Aquatic with Steve Zissou premiered ten years ago this Christmas, so let's take another trip on the Belafonte, shall we? 1. The Life Aquatic with Steve Zissou was inspired by a single image director and co-writer Wes Anderson had of seeing the inner workings of a boat cut in half. The vision ended up in the final movie and was created using a massive set that measured 150 feet long and 40 feet high. 2. Anderson was also inspired to make the movie because of one of his childhood heroes: Jacques-Yves Cousteau, the popular oceanographer and adventurer. Many of the details in the movie mirror Cousteau’s real life. The character of Zissou was originally supposed to be named “Steve Cousteau,” and besides being an ocean-documentarian like the fictitious Zissou, Cousteau also had a research vessel named the Calypso (Zizzou’s is the Belafonte), which, like Zissou’s ship, had a mini-sub, a gyrocopter, and a research balloon. Cousteau's crew wore red knit caps and uniforms, and his son Phillipe was tragically killed in a plane crash. 3. Cousteau can also be found in other Wes Anderson movies: Max Fischer, the lead character from Rushmore, finds an inscription in the book Diving for Sunken Treasure by Jacques-Yves Cousteau and Philippe Diole, which leads him to Miss Cross. Also, a Richard Avedon portrait of Cousteau can be seen behind Owen Wilson and James Caan’s characters in Bottle Rocket when the two are at a party. 4. 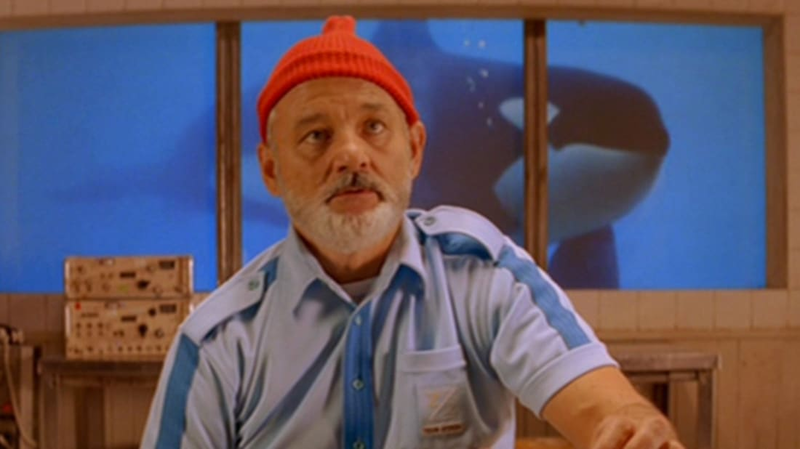 Besides the Cousteau influence, the now-famous blue polyester Team Zissou uniforms were also inspired by the uniforms worn by the characters on the U.S.S. Enterprise in the original Star Trek TV series. 5. Co-writers Wes Anderson and Noah Baumbach wrote the film over a series of lunches they had at a restaurant in New York’s Greenwich Village called Bar Pitti (they recorded the audio commentary for the DVD there too). In fact, many details that found their way into the movie were inspired by the restaurant. Zissou’s homebase, called Pescespada Island, was named after the swordfish entrée on the restaurant’s menu (Pesce spada is Italian for swordfish), the three-legged dog Cody was named after a regular the two would converse with at the restaurant, and Ned’s trademark stoplight graphic on his official red Zissou cap was inspired by a similar hat that Wes Anderson saw on a teenager in Bar Pitti. 6. The character of Steve Zissou was written specifically for Bill Murray. Anderson originally told Murray about the idea for The Life Aquatic on the set of Rushmore. Anderson allegedly wanted to make the character an amalgamation of Jacques Cousteau, the character of Guido Anselmi played by Marcello Mastroianni from the Federico Fellini film 8½, and Murray himself. Murray has appeared in every Wes Anderson feature film so far except for Bottle Rocket. 7. Other roles in the film written specifically for the actors were Owen Wilson as Ned, Anjelica Huston as Eleanor, and Bud Cort as Bill the Bond Company Stooge. 8. Ned Plimpton wasn’t always the genteel southern man he was in the film. Anderson added that character detail after he heard Wilson doing an impression of Wilson’s Armageddon co-star—and South Carolinian—Will Patton. 9. Anderson and Baumbach based Steve and Ned’s paternity storyline on a similar story that alleges film director John Frankenheimer is the father of film director Michael Bay. Bay previously directed Owen Wilson in the film Armageddon. 10. The Life Aquatic marks the first collaboration between Anderson and Roman Coppola, who served as the film’s second unit director. Coppola would later go on to co-write, co-produce, and again serve as second unit director on Anderson’s The Darjeeling Limited, provide the voice of the Squirrel Contractor in Fantastic Mr. Fox, co-write Moonrise Kingdom, co-write and co-produce Anderson’s short film Castello Cavalcanti, and was a part of the special photography unit on The Grand Budapest Hotel. 11. The Loquasto Film Festival director who moderates the Q&A in the beginning of the film is real-life NYU film professor Antonio Monda. Anderson cast Monda because the two were friends and he needed somebody who could speak Italian. 12. Team Zissou’s sound man, Renzo Pietro, is played by the movie’s actual sound mixer Pawel Mdowczak. In many of his scenes he’s carrying a live microphone to capture real-time audio from each take. 13. Oseary Drakoulias, Michael Gambon’s character in the film, is based on infamous Hollywood producer Dino de Laurentiis. Drakoulias’ glasses are modeled after similar glasses worn by director Sergio Leone. 14. The film was shot almost entirely at the famed Cinecittà studios in Rome, Italy. 15. The Belafonte was a real British minesweeper ship—first launched in 1958—that was originally called the HMS Packington. It was later sold to the Navy of South Africa and renamed the SAS Walvisbaai before it was bought by the production designers on The Life Aquatic in Cape Town and towed all the way to Italy. After the film was completed, the boat was bought in 2006 by an anonymous millionaire, restored, and docked in Dubai. It now serves as a yacht named the Mojo. 17. Cate Blanchett’s character Jane Winslett-Richardson was modeled after primatologist and anthropologist Jane Goodall. Blanchett’s character is pregnant during the film, and the actress had a body cast made in order to give her a fake pregnant stomach. Blanchett became pregnant in real life prior to shooting, so for half of the film she used the fake stomach and the other half she used her actual pregnant bulge. 18. Kumar Pallana, an actor who appeared in Anderson’s Bottle Rocket, The Royal Tenenbaums, and The Darjeeling Limited, was also supposed to appear in The Life Aquatic as Team Zissou’s cook, but his character was cut during the script phase of production. 19. The portraits of Zissou’s mentor, the fictional Lord Mandrake, are based on the likeness of photographer Jacques-Henri Lartigue. Much like Jacques Cousteau, Lartigue’s influence can be found in other works by Anderson as well. One of the most famous shots from Rushmore, which features one of main character Max Fischer’s many clubs, is based on a photo shot by Lartigue. 20. Before settling on Lartigue’s image as Lord Mandrake, Anderson wanted to use fellow director Nicolas Roeg for the part. But due to scheduling conflicts, Roeg couldn’t make it to Italy in time for what Anderson needed and the director had to back out. 21. If you look closely, one of the pirates is wearing a University of Texas knit cap. Texas is Wes Anderson’s college alma mater. 22. The moment when Steve pulls a gun on Jane while she’s interviewing him was entirely improvised by Bill Murray. Anderson thought it was so outrageously funny that he had Murray do it again in different takes and kept it in the movie. 23. Wes Anderson’s brother Eric and Owen Wilson’s father Robert both appear as Air Kentucky pilots at Ned’s funeral aboard the Belafonte. 24. All of the undersea creatures in the film were done using stop motion animation, and were created by legendary stop motion director and animator Henry Selick who is best known for directing The Nightmare Before Christmas. Selick and Anderson were originally going to re-team after The Life Aquatic on Anderson’s own stop motion animated film Fantastic Mr. Fox, but Selick dropped out of the project to direct his own animated feature, Coraline. 25. Selick’s Jaguar Shark puppet measured 3 meters long, and was the largest stop-motion puppet ever created. In order to give it a sense of floating through water, all the stop-motion animation on the Jaguar Shark was done upside down to make it sag against gravity. 26. Co-writer Noah Baumbach has a cameo in the film as Phillip, the assistant to Michael Gambon’s character Oseary Drakoulias. Anderson and Bambach would go on to work together again: Anderson produced Baumbach’s 2005 film The Squid and the Whale, and they also co-wrote Anderson’s adaptation of Fantastic Mr. Fox. 27. The stairs and door seen in the final shot of the movie is the actual a back entrance to the Quirinal Palace in Rome. Anderson discovered the location by accident while riding his bike around Rome looking for a particular gelateria. 28. The song "Let Me Tell You About My Boat" by the film’s composer Mark Mothersbaugh, which plays over the cutaway shot of the Belafonte, is actually the melody of the song “Scrapping & Yelling,” which Mothersbaugh wrote for Anderson’s film The Royal Tenenbaums, played backwards. Despite Mothersbaugh scoring all of Anderson’s films up to and including The Life Aquatic, it is the only one of Anderson’s films to include a song by Mothersbaugh’s band, Devo. 29. The Life Aquatic is the first Wes Anderson film not to include a song from The Rolling Stones on the soundtrack. 30. Musician and actor Seu Jorge, who plays Pele and can be seen singing David Bowie songs in Portuguese in the film, compiled all of the Bowie songs recorded during the movie and put them together in a record called The Life Aquatic Studio Sessions Featuring Seu Jorge. 31. The idea for the end credit sequence, in which all of the film’s characters—including Ned—return for a sort of curtain call, was taken from a similar sequence in the 1984 film The Adventures of Buckaroo Banzai Across the 8th Dimension. 32. A line in the end credits reads: “The filmmakers acknowledge that the real Steve Zissou is a prominent attorney in New York City specializing in complex federal litigation.” The movie studio had to negotiate with a real-life lawyer named Steve Zissou in order to use his name for the title character. According to the real-life Zissou, "It's been, to my surprise, a lot of fun, and I think Bill Murray is America's greatest living actor."